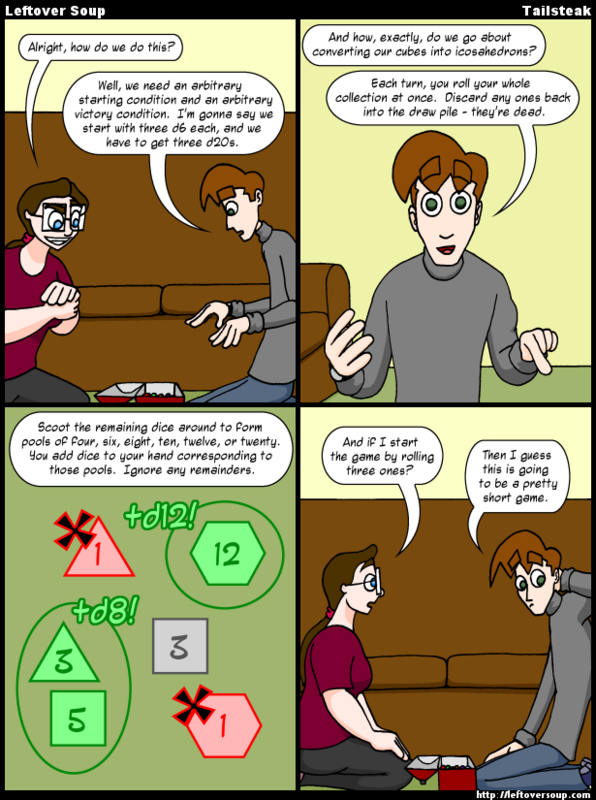 And there you go, game number three in this comic. Dice Farmer is actually pretty fun, it can be played solitaire, and it's something you can do while waiting for D&D to start. Depending on what conditions you set, a typical game only takes about five minutes. Rolling three 1s with 3d6, of course, is only a one in 216 chance, but more than possible. In fact, Dice Farmer is one of the few games in existence where you could conceivably be light years ahead of your opponent, with dozens of dice in your hand, then roll them all at once... and spontaneously lose absolutely everything. Depending on how you want to play it, you could add a rule that once you're reduced to zero dice, you start again at 3d6, but it's up to you. EB: Alright, how do we do this? JH: Well, we need an arbitrary starting condition and an arbitrary victory condition. I'm gonna say we start with three d6 each, and we have to get three d20s. EB: And how, exactly, do we go about converting our cubes into icosahedrons? JH: Each turn, you roll your whole collection at once. Discard any ones back into the draw pile - they're dead. JH: Scoot the remaining dice around to form pools of four, six, eight, ten, twelve, or twenty. You add dice to your hand corresponding to those pools. Ignore any remainders. EB: And if I start the game by rolling three ones? JH: Then I guess this is going to be a pretty short game.